October 16, 2013. Posted in Kolkata. Bakra Eid is a time to spend with family, in prayer and, as the name would suggest, with goats. The Muslim holiday honors the prophet Ibrahim’s willingness to sacrifice his son Ismail in obedience to Allah’s command. Jews and Christians may remember the punch line from Sunday School: at the last minute, Ismail was replaced with a lamb, and father and son were left to feast on delicious kebabs together in the desert. Known as Eid al-Adha in Arabic, or Feast of the Sacrifice, South Asians call the holiday Bakra Eid – bakra means goat in Hindi and Urdu. 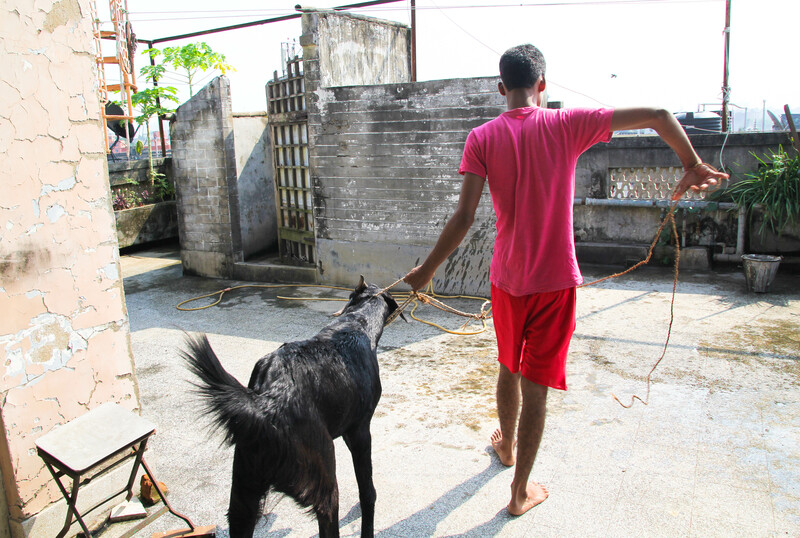 We were fortunate enough to celebrate Bakra Eid with our friends the Hussains in a Muslim neighborhood in Kolkata. The first item on the day’s agenda after the morning namaz was slaughtering four goats in honor of each of the household’s women. After the kurbaan (sacrifice) was performed on the Hussains’ terrace with the blessings of the local mosque’s imam and the help of a neighborhood butcher, we settled down to a hearty breakfast of goat brain curry, chicken stew, potatoes, and paranthas drenched in ghee. To aid digestion, we sipped sugary tea and listened to the sounds of the street – goats bleating before the inevitable, crows cawing as they contemplated how to get a piece of the action, and kids screaming with joy like the ones we witnessed sitting on a cow to hold it down for the butcher’s blade. This breakfast was not all the man who prepared it had up his sleeve. The Hussains’ cook, Shaik Azad, or Azad Mama (mama is Hindi for uncle) as he is affectionately known, is a mutton biryani master. 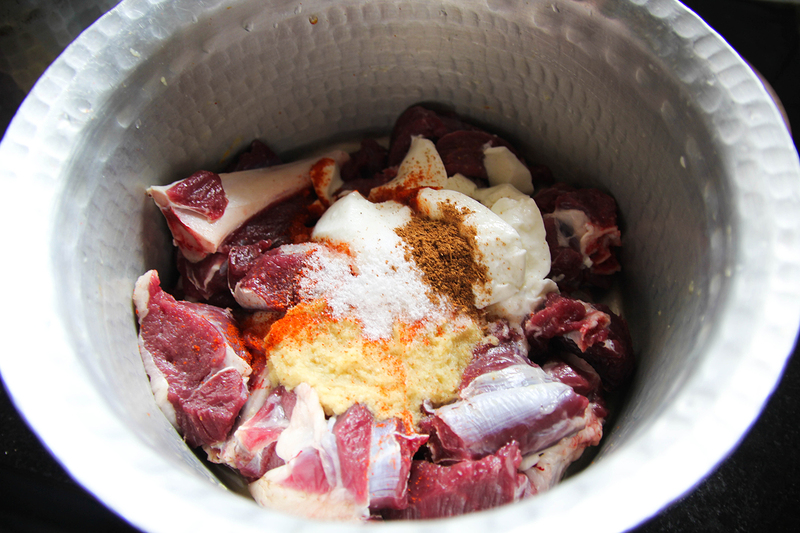 Bakra Eid, when freshly slaughtered goat abounds at the Hussain household, is the perfect day to find yourself in Azad Mama’s kitchen. While Begum Hussain and a few helpers neatly allocated the meat of the four goats into portions for relatives, friends of the family, and poor members of the community, Azad Mama shared his life story and his biryani recipe. 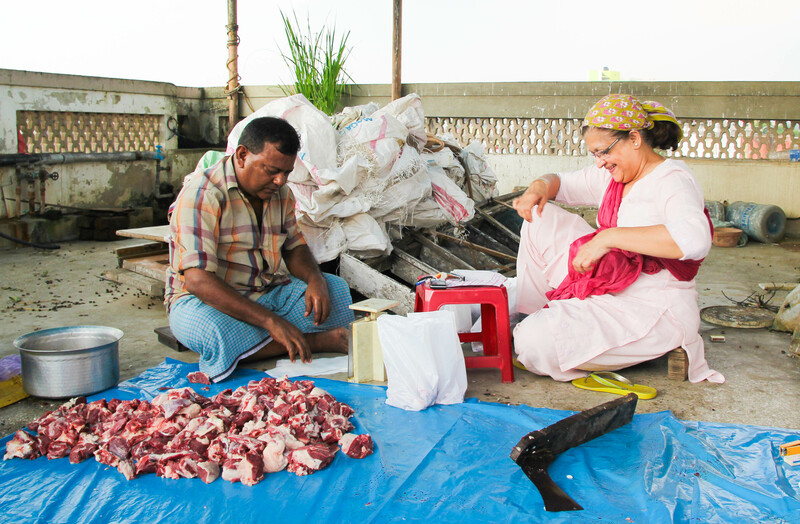 Azad Mama and Begum Hussain divide meat for family, friends, and the poor. Born in Hatgacha, a small village an hour outside of Kolkata, Azad Mama came under the employment of Anwar Ali Sheikh, the Hussain’s patriarch, when he was 8 years old. Azad followed Ali, a tea exporter and member of the West Bengal state legislature, to Kolkata where he ran errands and served tea to guests – the most basic task of being a chai wallah. As he grew up, he watched the family’s cooks work in the kitchen and experimented with recipes of his own. “I’ve always liked to try new things,” he said. “I’ll cook prawns one way, fish another, and just see how it turns out.” Today, the biryani turned out delicious, its fragrant aromas filling the entire five-story building, masking the smell of goat meat coming from the roof. Pour enough oil into a kadai or deep pan to cover the onions. 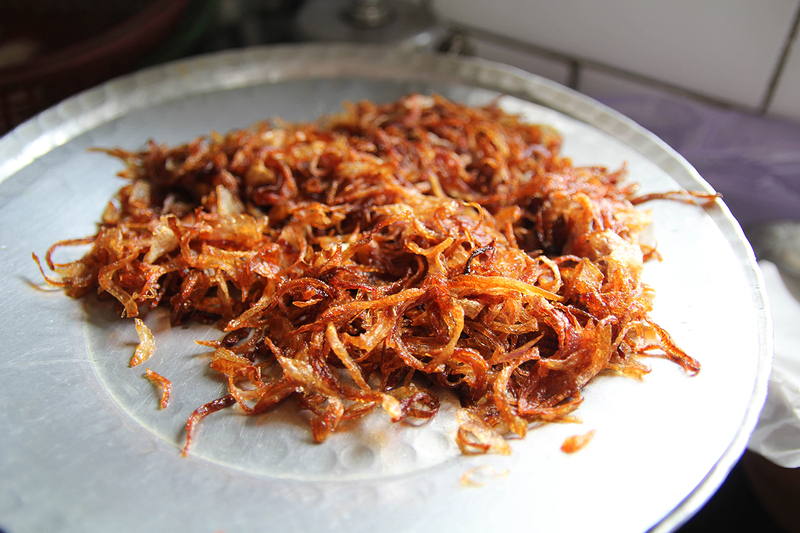 Fry onions until they are brown and crisp. Drain and set aside. Mix mutton with yogurt, garlic and ginger paste, 2 tbsp biryani masala, 1 tbsp red chili powder, about a quarter of the fried onions, and salt to taste. Marinate for an hour. Soak saffron in warm milk. Set aside. Rinse rice, then soak in cold water for 30 minutes. Drain and set aside. 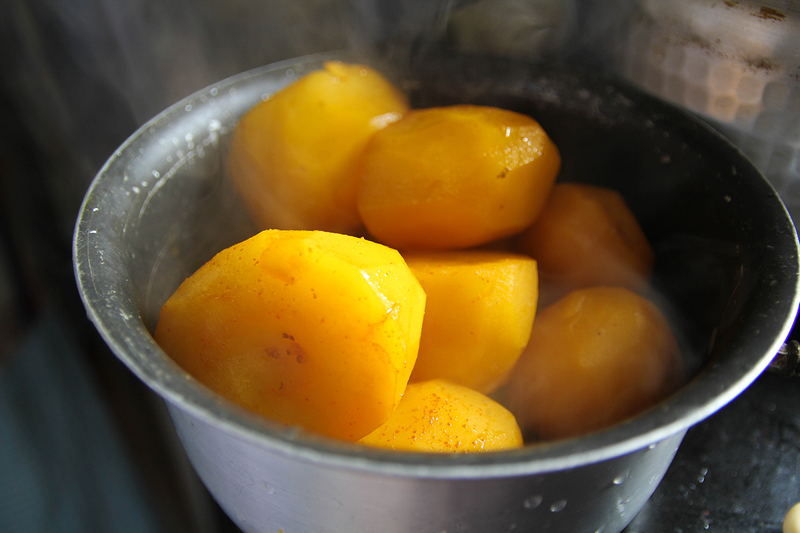 Boil potatoes in water with 2 tbsp ghee, 1 tbsp turmeric, 1 tbsp red chili powder. Drain and set aside. Heat 2 tbsp ghee in a pressure-cooker or a thick pan. Add marinated mutton and cook on high heat for 5 minutes. Add 1 cup water, cover and let cook on medium heat for 15 minutes, stirring from time to time. Add potatoes to the mutton and let simmer on low heat until gravy is thick. Transfer to a dum if you have one; if not your widest pot will do. Parboil rice five cups of water, cardamom and salt to taste for 10 minutes, or until about ¾ done. Strain rice and layer over mutton and potatoes. Add remaining fried onions. Dot the rice with 2 tbsp ghee. Pour saffron milk over mixture. Serve with cucumber-onion raita and enjoy! Your posts from Kolkata have been most informative. The lamb brain curry for breakfast must have been something else!!!! 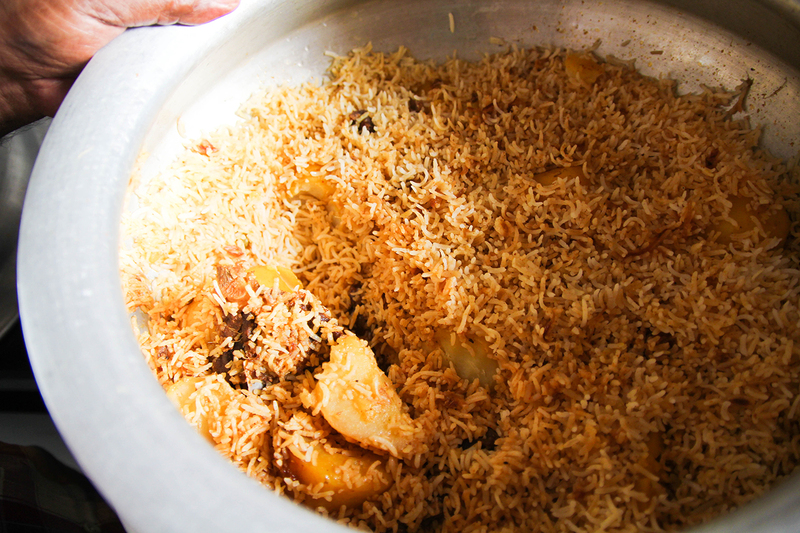 The word ‘Biryani’ is thought to have been derived from Farsi ‘Biryan’ meaning ‘fried before cooking’. In Persian ‘Beryn’ means ‘fried or roasted’. It’s believed that earlier rice was fried in ghee without washing and then was mixed with gost (Mutton specially lamb or dumba) and spices before being served. This delicacy might have originated in the lands of Persia (now Iran) or Arabia in the mid-medieval period. Legend says, the art of biryani came to be known in India with the Muslim invasion. The spread of knowledge might have followed from Iran/Arabia to Afghanistan to India (Pakistan was a part of integrated Hindustan then). Another legend says, the invaders brought this art to India via Kazakhstan and Afghanistan. Whatever may be the mode, Mughals can be duly credited for introducing biryani in India. It’s said that somewhere around the early 17th century Mumtazmahal, wife of Shahjahan (Taj Mahal was built in her memory), once visited a regimen only to find the prevalence of mal-nourishment. She ordered the chef to prepare a balanced diet for the soldiers, thereby popularizing a new dish- Biryani. Although some historians refute this fact. They project a document where it’s mentioned that in 2nd century AD, long before the Mughals arrived, South India knew something which is kind of precursor to modern biryani. Nowadays biryani gained popularity in almost all non-vegetarian communities of India. Depending upon the taste and slight variation in preparation as well as serving procedure biryani in India is differentiated into many sub-class. Lucknow biryani, Kolkata biryani and Hyderabad biryani are the few main to mention. Perfect “keyhole” shot. Eid mubarek! Can’t believe they allowed small children to witness that. I get that it’s supposed to be a sacrifice, but can’t one offer something symbolic to God – like a nice, blood-red watermelon? And I’m not vegetarian – just slightly disturbed to see the pics.